Red Seal Smokers Toothpaste is made especially for Smokers. It offers MEGA strong breath freshener qualities with stain removing abilities. 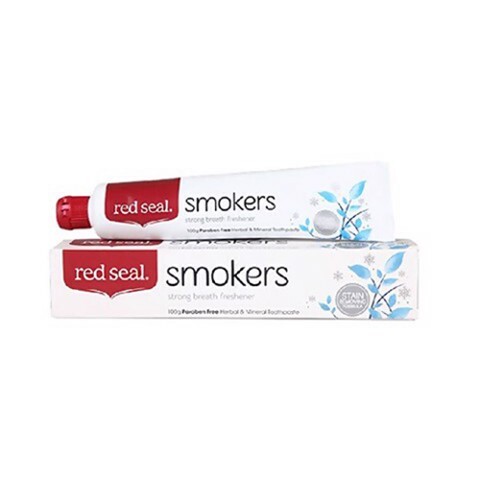 Red Seal Smokers Toothpaste is designed to also fight plaque and control tartar. It also contains Calcium Carbonate, a high purity finely ground mineral for cleaner, whiter and stronger teeth. The Dolomite Powder in this natural Toothpaste also helps to removes stains that ordinary toothpastes leaves behind. Has no added fluoride. Natural antibacterial action. Color and Paraben free! Has NO tricoslan, peroxide, potassium nitrates, or strontium chloride. No added fluoride. There is conflicting evidence on the benefits of fluoride. Excess fluoride may cause chalky white patches on the teeth giving a mottled appearance. Red Seal provides you with a range of non-fluoridated toothpastes to meet your specific needs. Strong peppermint flavour to freshen breath. Contains natural herb extracts and oils. No tricoslan, peroxide, potassium nitrates, or strontium chloride.